Size of the head pillow: length 25.5" (65 cm), height 12.9" (33 Cm). 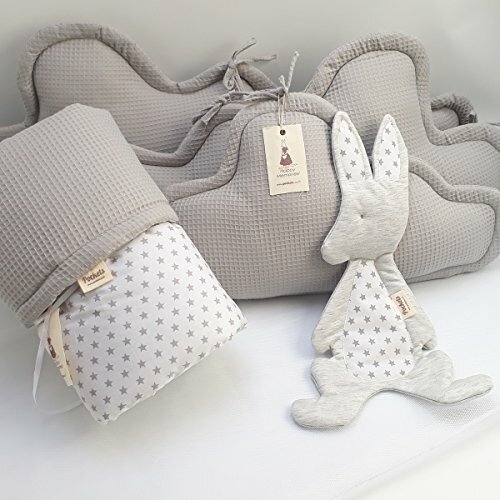 The Clouds pillows head bumper is modular and Contains three pads for each side of the crib It is an excellent alternative for the traditional baby's cot bumper since the three separated pillows are made to use both in a cradle and in a crib (when the edges are overlapping inside the cradle(. The cloud pillows will accompany your child once he stops using the crib as a decorative fun accessory in the room. This bedding set made of high quality 100% waffle cotton fabrics. Easy to wash, the pillows don't get tangled in the washing machine since the stuffing is stitched together to the cover of the pillows. Just use a genital cycle on the washing Machine and dry flat can be ironed. If you have any questions about this product by Pockets Baby & kids, contact us by completing and submitting the form below. If you are looking for a specif part number, please include it with your message.